A. Yes, we are a licensed and insured moving company, PUC CAL-T 189933. You can view us online at the California Public Utilities Commission website. Q. Do you need to come to my home to give me an estimate? A. We recommend you ultimately invite your mover to your home to start the estimate process. This way they can collect all of the details pertaining to your move and provide you with an accurate estimate. Viewing your location helps to prepare your mover and make your move more efficient, saving your bottom line. Q. How soon do I need to contact a moving company? A. The best time to call the moving company is as soon as you know you need to move. That way you can tentatively reserve a space on their schedule with no obligations until you receive a written estimate and confirm you would like to move with the company. Don’t worry about ‘locking in’ to a certain date…most moving companies are somewhat flexible with their dates and will try to accommodate you as best as they can. Q. How long does it take to receive an estimate? A. It takes approximately 20 minutes to receive the details of your move while meeting with you at your move-out location. We can shorten the time for you if necessary…After that we produce an estimate for you and send it via email approximately 48 business hours after the visit, or sooner (same day) if you need. Q. Do you give a ‘Not to Exceed’ amount on your estimate? A. Yes. In almost all cases we are able to apply a ‘Not to Exceed’ amount to your estimate. If the time it takes to do your move goes over the original estimate, you will not be obligated to any fees over the‘Not to Exceed’ amount. Q. Do you ever NOT give a ‘Not to Exceed’ amount on an estimate? A. This is rare, however there are some cases where the total scope of the work is unknown (ie., If you are not sure exactly what is going or staying, if you are not yet organized for your move, etc.) and we are unable to apply a ‘Not to Exceed’ amount to the estimate. We can help you determine how to get to the point of being able to have us give you a ‘Not to Exceed’ amount before you move. Q. Do you have an hourly minimum? A. Typically we have a 3 to 4 hour minimum, depending on the job…this depends and changes due to many factors…Please simply call us or write us to let us know what your specific needs are. 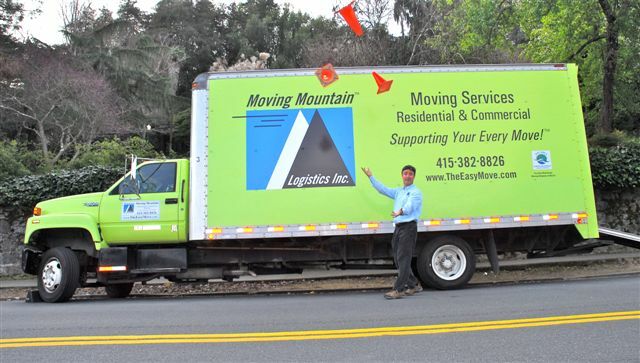 If your move is exceptionally small and you are on a tight budget, we can refer you to Cameron and his wonderful company, Marin Student Movers (seeResource Page). Q. Why are moving fees seemingly high? A. Please call us for an updated quote. Our fees compete with other moving companies in the Marin area that are licensed and insured. 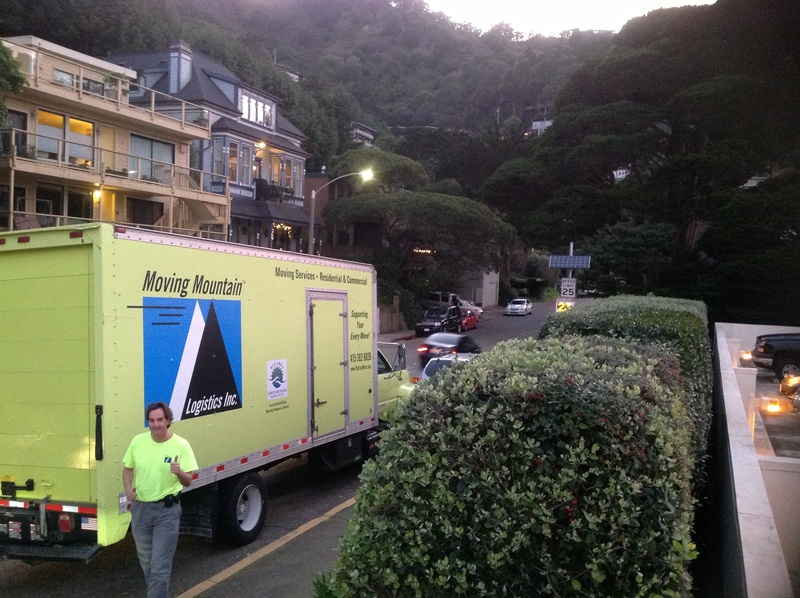 Amongst several Marin moving companies, the range for 2 men and a truck is between approximately $110-145.00 per hour. The fees are structured to cover the costs of insurance for the employees, trucks, and liability, all of these costs much higher in the moving industry due to higher assumed risk. Every business is different, including what the employees are paid and of course the value that the company provides to its clients. We consider our employee pay and value ad for our clients some of the best in the industry, next to most moving companies out there. Because of this we have happy employees, better employee retention, and grateful clients. It’s a win/win for everyone, our employees and clients! Q. Do we need to provide you with a deposit? A. Deposits are helpful to our small business although they are not mandatory. We are very flexible with this and sensitive to your needs. Q. How much should we send for our deposit? A. Our clients typically send up to one half of the original estimate for a deposit. Q. Where do we send our deposit? Q. Is our deposit refundable if we cannot or decide not to move with you for any circumstances? A. Yes, we will refund your deposit under any circumstances if you are unable to move on your moving day and cannot re-schedule at that time. A. You may pay with personal check, cash or visa/mastercard. Q. Do you accept American Express or Discover Card? A. Visa and MasterCard only. Q. Do you accept terms? A. Yes, we are flexible and accept 30/60/90 day terms depending on your needs. We realize moving is a large expense up front. Any way that we can help you receive a great moving experience from Moving Mountain would be our pleasure. A. Yes, we provide coverage options. Technically, we do not refer to it as ‘insurance’ in the moving industry. You may or may not opt for coverage, dependent on your needs. Please check with your home owners or renters insurance to find out what portion of a professional move is or is not covered. Your elected coverage provides you with compensation for loss or damage to your goods on your move. Please review the details on your paperwork that you receive from the estimator regarding your options. Q. Do you provide packing services and materials for our household goods into boxes? A. Yes, we can provide packing and materials. Again, as soon as you know you think you need help with packing, please let us know and we will help you to coordinate this. Q. Can you give me a packing estimate? A. Yes, we can provide you a packing estimate at the same time we estimate your move. Q. Can we hire you to pack only a portion of our household goods? For example, just our kitchen and fragile items? A. Yes, you can hire us to do only a portion of your packing if you like on an hourly basis. Q. Do we label our boxes? A. Yes, best to label your boxes on the ‘end’ of the box, so when they stack you can still see the contents. Q. Do we need to pack contents of drawers? A. Not if they are clothes and/or linen. Soft and non-fragile items in dresser drawers do NOT need to be packed. Desk drawers, drawers with sentimental, high value, or fragile items are best packed into boxes. Q. Do you pick up used boxes after our move? A. Yes, please break them (all good, solid moving boxes only) down and stack them neatly for pick up in a dry area. Call us when you are ready. (We will not take other refuse, garbage, styrofoam, or scrap cardboard, etc…please put this in your recycling container). Q. Do you pack and move these items? A. Yes, we move lamps, pictures, and flat screen TV’s. We package them with our pads and protective cardboard if necessary and shrink wrap. Q. If we want to, can we move these items? A. Yes, you may move anything you want to your new location to help your bottom line. Smaller lamps go nicely with sofa cushions or throws into a box. Please be sure to place anything that you plan on moving yourself, into a location that will not impede the movers progress at your destination. Q. Do you supply wardrobe boxes for our hanging clothes? A. Yes, we can supply wardrobe boxes for your move. Typically we bring these pre-assembled on the day of your move. We can help you to load and unload them or you can participate as much as you want. We like to empty them for you at your move-in location so that we may re-use them for our next move. Q. Can you supply wardrobe boxes prior to the move? A. We typically do not deliver these prior to your move…but sometimes make exceptions. Please simply ask us. Q. Do you wrap and protect furniture? A. Yes, we wrap and protect furniture with our pads and shrink wrap wherever needed. This protects your walls and both ends, and the furniture itself. Q. Do you protect flooring? A. Yes, we have rubber mats to lay down to protect flooring. We have carpet protector to protect against rain and mud. Q. Do you put our beds together before you leave our new location? A. Yes! And we can put furniture back together that needed to come apart during the move. Q. Do you provide labor only if we want to unload our truck coming into the Bay Area from out of state, or if we want to load and leave the Bay Area? A. Absolutely, we can offer assistance with loading and packing your rental truck professionally. We recommend buying at least 100’ of small ‘rope’ or ‘twine,’ wardrobe boxes for hanging clothes, picture cartons for glass and/or pictures or mirrors, and a few rolls of packing tape, renting pads/blankets along with your rental truck and a furniture and/or box dolly if you need them at either location, and a lock for the back of your truck. Q. Can you move us into or out of storage? A. Yes, we can move you into or out of storage. Although we do not have our own storage warehouse, we can help you determine the best and most cost effective storage for your items. Whether you need climate controlled, small or big space, we can help determine what is the best for you. Q. How do you protect items while in storage? A. We can wrap your items in paper pads and/or shrink wrap if needed to protect your goods from moisture and/or dust. Q. If we need storage for only 1 or 2 days or up to 3 weeks or so, do you store items in your trucks? A. Yes, we can arrange this if necessary. We look at the most cost effective and efficient way for you to store things temporarily. Q. Are your movers Moving Mountain employees? A. Yes, our movers are our employees. Please feel free to view some of their biographies on our website. They are all kind and experienced gentlemen. Q. Do we tip your movers? A. Gratuity is not mandatory but customary and graciously accepted by gentlemen. If you would like to discuss an appropriate amount, please just ask us. Q. How big of a truck are you going to use on our move? A. Overhanging tree limbs, curved roads and steep driveways all determine the size of the truck needed at your move-out and move-in locations. We determine this after looking at all of the details of your move. Sometimes we use smaller trucks, sometimes we use bigger trucks, and sometimes we use multiple trucks. Q. Do you provide parking permits? For example, if we live on a busy S.F. street? A. Yes, we can obtain parking permits for you from the Police Department. We know the officers personally at each of the station houses. Q. What if your truck blocks our neighbor’s cars and/or driveway? A. Please remind neighbors of your moving date to allow for truck parking if necessary. We do not have a problem moving our vehicles if necessary on the day of the move…this only takes a moment. Q. Should we provide water and or something to eat for the movers? A. We would not turn you down…although this is certainly not necessary. We are grateful for anything you would like to offer our hard working crew. Q. Can we help you? A. You do not need to help us, however if you would like to help, simply ask the head mover what you can do for your move to be more efficient. We do not allow our clients onto our moving trucks or to operate our equipment or lift with our employees for liability reasons. Q. Can you change our moving date if needed? A. Yes, we can change your move date if necessary. We understand your moving date may change due to unforeseen circumstances. It is our goal to remain as flexible as possible and to accommodate your changes and logistics due to home sales and purchasing delays, contractor schedule changes, the weather, etc. We move you when you want! Q. Do you still move us if it is inclement weather? A. Moving Mountain has never cancelled a move due to inclement weather. You may wish to reschedule your move anytime. However, if the weather is extreme, and may present danger to the crew, your goods, or your person, we may opt to cancel the move and re-schedule after consulting with you. A. Unless your friends are helping to keep your pets and kids out of harms way on moving day, we suggest professional childcare or pet sitting on moving day. Q. Do you do moves to the moon? A. We are currently working on a partnership with NASA to be able to move people to the moon by the year 2023. Please refer to our website to stay informed on this future service.